Is Noise An Important Factor When Looking For A Garbage Disposal? Which Small Garbage Disposal Is Easier To Install? Most people are looking for garbage disposal they can fit under their kitchen sink. But the size shouldn’t be the only criteria you should keep in mind. Garbage disposals come with different motors, so they will be able to grind through different things because of that. In the following article, we review small garbage disposals available on the market today, and we explain how to find the right model for your household. Our quick buying guide will help you decide on the right size for your garbage disposal, so you can make an informed decision when you buy one. The Moen GXP50C is a remarkable piece of kit. 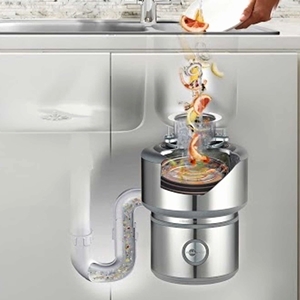 This garbage disposal has a 1/2 HP motor and is capable of disposing of your everyday kitchen waste. One of the best features of this model is the universal mount installation that fits most of the existing 3-bolt assemblies, including those produced by competitors. The garbage disposal is lighter and more compact than other models of similar power, so it will free up more space under your sink. The compact design allows this disposal unit to fit under most countertops, even if you use a shorter model. This garbage disposal unit uses a permanent magnet motor capable of producing 2,600 RPM. One of the advantages of using this kind of motor is that it can reach its maximum speed almost instantly, so you’ll experience fewer jams. Another advantage of choosing this garbage disposal is the pre-installed power cord. This will allow you to install the unit quicker, without having to hardwire it into your electrical circuit. Combining this feature with the universal installation mount makes this model very easy to install, so most people will be able to do it on their own, without having to call a professional. The installation process will be very quick, especially if you already have a mounting assembly attached to your sink. This is another great value product from Moen. The GXP33C uses a Vortex 1/3 HP motor capable of grinding most of the food waste you produce. Like all Moen garbage disposals, this model also benefits from the universal mount installation feature. This feature will allow you to install the unit on most existing 3-bolt mounting assemblies, including those produced by the competition. Another great feature of this model is that it comes with a pre-installed power cord. This will allow you to install the unit quicker, without needing to hardwire it into your electrical circuit. All you need is a 110V outlet close enough to power the unit. The GXP33C comes with a 1/3 HP Vortex motor. This is a permanent magnet motor, and it’s capable of producing up to 1,900 RPM for a fast and reliable grinding action. 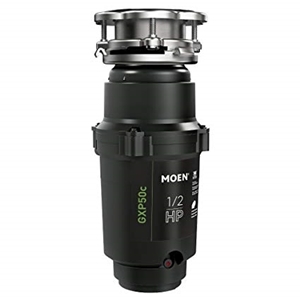 Unlike the motors used by competitor companies, the ones used by Moen are capable of reaching their top speed almost instantly, so the food particles will be broken down into small pieces very quickly, causing fewer jamming problems. The compact design of the disposal unit will allow you to install it under every kitchen sink and have room to spare. The pre-installed power cord and the universal mount will make the installation process quick and easy, so you will be able to install the unit yourself. 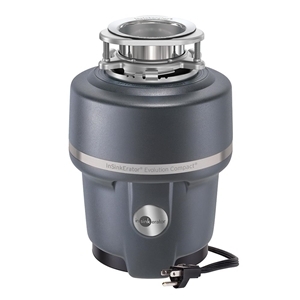 InSinkErator is one of the best-known garbage disposal brands in the world, and that’s because they produce high-quality efficient units. 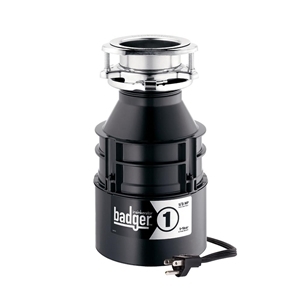 The Badger is their standard disposer collection, and this model used a 1/3 HP motor. One of the best features of this model is an easy and straightforward installation. It doesn’t matter if you owned InSinkErator garbage disposal before or not, you will be able to install the unit quickly by yourself, without professional help. If you previously owned garbage disposal and you want to replace it, the whole process will take under 30 minutes. Just twist the old unit and remove it, twist the new one back in its place, hardwire it, and you’re good to go. You don’t have to worry if you didn’t use garbage disposal before. The Quick Lock sink mount is easy to install and there are a lot of instructional videos online to help you. Another great feature of this model is the induction motor. Even though this motor is not one of the most powerful this company produces, it will be more efficient than other motors of similar power used by the competition. With the help of this motor and the galvanized steel construction, this garbage disposal model will deliver exceptional performance at a reasonable price. Power cord compatible. The power cord is not included. 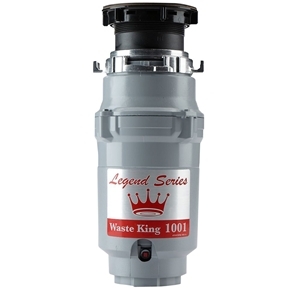 We couldn’t create a list of small garbage disposals without including the Waste King L-1001. This is one of the best value garbage disposal models, and it’s small and compact. The L-1001 is easy to install, is quiet, and it comes with a 2-year in-home warranty. This is another great garbage disposal unit produced by InSinkErator. This model is slightly larger than the Badger 1 we included higher in our list, but it’s also more powerful. It uses a 3/4 HP motor, and it’s very efficient, especially for a unit its size. There are several factors you have to take into consideration when you’re looking for garbage disposals in general and the small one in specific. In the following section, we explain what to expect from a small garbage disposal, and how to choose the right one for your household. You don’t have to settle on the least powerful garbage disposal model just because you want it to fit under your kitchen sink. You have to take other factors into consideration, as well. Do have a water filter under the sink or not? How large is your household? How often do you cook? Not all the small garbage disposers have the same grinding power, so the answer to these questions will help you find the right one. 1/3 HP – These are the smallest garbage disposal units, but they’re also the least powerful. The main advantage of using this type of unit is that it will definitely fit under your sink, even if there’s not too much space under your countertop. These units are usually recommended for smaller households, with only one or two people. They are powerful enough to handle most of the everyday kitchen waste, but you shouldn’t use them for anything else than vegetables and fruit leftovers. One disadvantage of using this kind of units is that they tend to jam more often, especially if you try to grind tough components, or if you try to dispose multiple things at once. Another disadvantage of using this kind of disposal unit is that they usually don’t have noise reducing features, so they might actually be louder than larger units, even though they’re less powerful. 1/2 HP – These units are slightly larger than the 1/3 HP ones, but they’re also more powerful. The extra power will make them more efficient at grinding through slightly tougher waste, but you should still be careful what you use them for. These models are usually recommended for medium households, and they’re better than the 1/3 HP models because they’re built with better materials. They usually have more stainless steel components, and that makes them more durable. Another advantage of using this type of garbage disposals is that they usually have a soundproofing feature which makes them more silent than the smaller models. 3/4 HP – These are the largest of the small garbage disposal models. While they are still small enough to fit under most kitchen sinks, you might want to measure the available space before you order one, just to be safe. 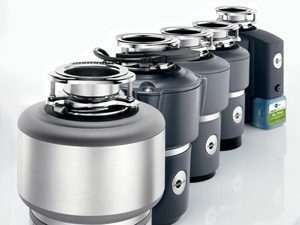 These are the garbage disposal units most professionals recommend because they deliver the right mix of size and efficiency. Unlike the previous types of disposers, these ones are more powerful, so they will be able to grind through more kinds of waste, and they will jam less often. You can even dispose of small bones when using this type of units. Most professionals recommend these models for medium to largely sized households. You should consider these units if you’re the kind of person who likes to cook, and does it more often. This kind of garbage disposals are better soundproofed, so they will be less noisy than other models. When it comes to garbage disposal units, most people have unrealistic expectations. If you want a unit which can grind through bones like celery, you’re not looking in the right place. Small garbage disposals can be efficient, but you should keep in mind that their size is directly correlated with their power. So, what can you use these small garbage disposals for? 1/3 HP – These are the least powerful garbage disposal units, and they have limited use. They are powerful enough to grind through most vegetables and fruits, but you can’t use them for anything else without risking jams. 1/2 HP – These units are more powerful than the previous ones, and they are the ones recommended for standard home usage. They are powerful enough to go through most soft kitchen waste, and they are still small enough to fit under every sink. 3/4 HP – These are the most powerful small garbage disposals. They are recommended for medium households and are very efficient. They have stainless steel components that can grind through all soft kitchen waste, but it can also be used for tougher waste like small bones. Many customers complain about the noise levels their garbage disposal produces. Even though most people believe that buying a small garbage disposer is the best choice if you want a silent unit, this is usually not true. 1/3 HP – These are the smallest and least powerful units available on the market, but they’re not the most silent. The problem with these units is that they have many plastic components. These components can produce a small echo inside the unit, and that will amplify the noise produced by the motor. Another disadvantage of using this kind of garbage disposals is that they do not have any sound deadening features, so you will hear every sound they produce. 1/2 HP – These units are more powerful, so their motors will produce more noise. However, they are usually constructed with better materials, so the noise will often be impeded, so you won’t hear all of it. Another advantage of using this type of units is that they sometimes have sound deadening features which will block part of the sound the motor produces. 3/4 HP – These are the most powerful small units, and they also have the loudest motors. Fortunately, all of these models have good sound deadening features which are able to block most of the sound the units produce. This can actually make them more silent than the previous models. Another advantage is that they are also built with better materials, so the construction will stop some of the sound produced by the motor. Due to their compact size and lightweight, all of these units are easier to install than larger models. However, not all garbage disposals are created equal, so there are some differences in the installation process. 1/3 HP – These models are easy to install, and most people will be able to install them without professional help. They are lightweight and compact, so a single person will be able to install garbage disposals alone. Some models come with a power cord, so you don’t have to hard wire them in your electrical circuit, making the installation process easier. 1/2 HP – These models are also easy to install. The size and weight difference between these models and the 1/3 HP ones are not significant, so a single person will be able to handle the installation alone. Some models come with a power cord for a quicker installation, while others are compatible with power cord use, but you have to buy the cord separately. Most of them come with easy installation features like a universal mount which will simplify the installation process, especially when you’re replacing an old unit. 3/4 HP – These models are larger and heavier than the previous ones, and the differences between them and the 1/3 HP models are significant. Most models are too heavy to be installed by a single person without help, so you either have to call someone to help you, or you have to improvise and place the unit on a stool to support it during the installation. Some models are compatible with power cord use, while others aren’t. When you think about the advantages that a small garbage disposal can bring, it’s evident that it’s always good having such a unit at home. If you have any question about these units, need tips and tricks, or simply you think there’s a certain disposer that has to be on this list – feel free to share below.